our rainy, cool weather this year was a boon for the berries. our strawberry season lasted a month and the red and black currant bushes were loaded with berries that i made into bottles and bottles of cordial for the winter. 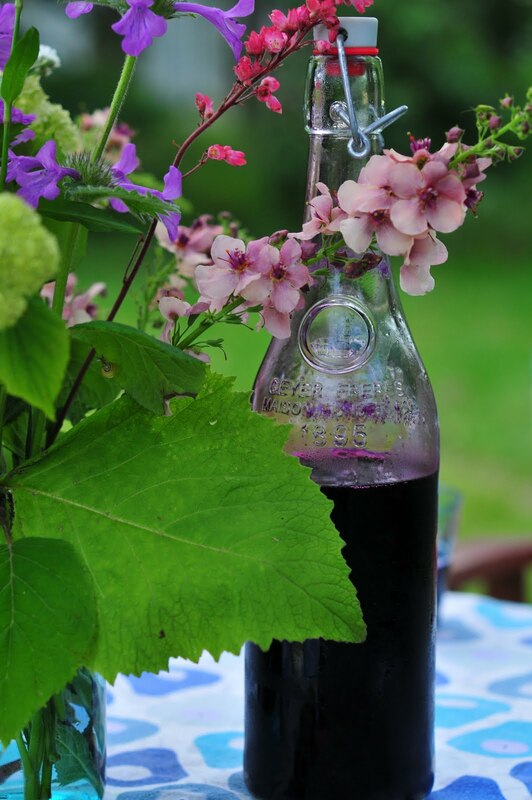 the blackcurrant cordial might be the best one of them all, tho' the more recent one i've made of elderberries is a close second. if you want to give it some zip, add some slices of fresh ginger root, or throw in a vanilla bean. i also mixed them occasionally - red and black currants together. strawberry and rhubarb (it's a classic), tho' i kept raspberries and elderberries alone, because they're so outstanding on their own. the elderberries have the faintest undertone of their spring version - the elderflower, but with layers of autumn on top. mixed with hot water and a dash of vanilla vodka (see below), they make a gorgeous, warming drink, for a nippy but clear autumn day. i made several batches using honey instead of sugar, since we've also got our own bees and i had a lot of honey on hand - the result was a deeper, more complex cordial. autumn raspberries - they produced from august - october! i've been throwing a handful of whatever berry is in season into this jar and topping it up with vodka all summer - it will make a lovely fruity tipple come christmas time - filled with the echoes of summer during that dark time of year. all you do is take a cup of organic sugar, all the berries you have at hand and keep them covered with vodka. 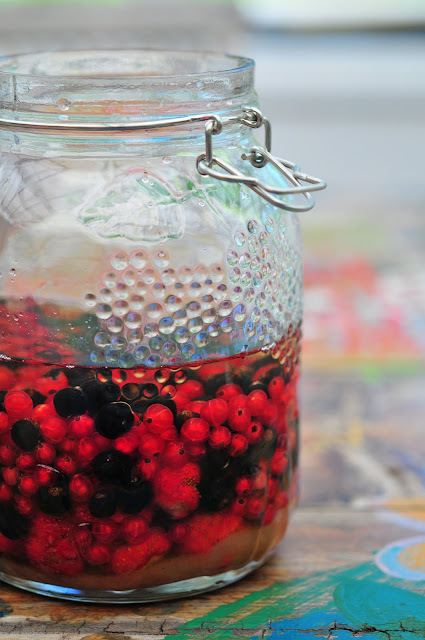 whenever you add more berries, if they're not submerged, add more vodka. this one was started in june and i added the last berries in october (photo from the beginning). you can also use rum (hence the name - rumtopf), but we're vodka drinkers around here, so that's what we used. the cordials can be mixed with fizzy water for a sparkling drink. they're great with white wine or a dash of vanilla vodka. they can be quite tasty with lemon schweppes. they're also just fine with plain water - hot or cold, depending on your weather. the limits are only those of imagination. 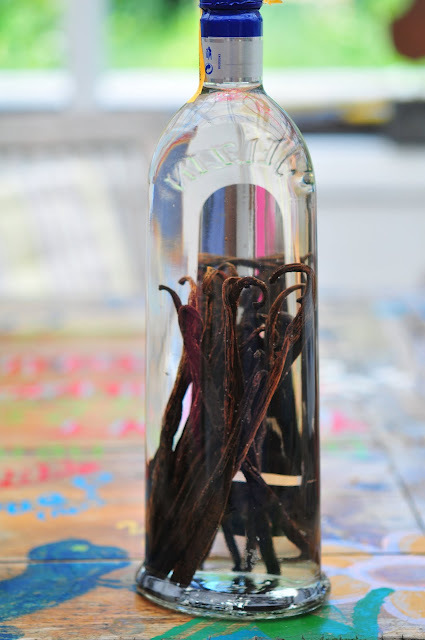 thanks to my buddy chris, who is a co-contributor over on the sustainable life blog, i ventured into making my own vanilla vodka. she was making vanilla extract and i've got a batch of that going as well, but decided to make some vanilla vodka for drinking as well - it tastes more natural than the absolut version. it's a very nice companion when you're using these cordials as the base for a cocktail. if you check eBay, you can find great prices on vanilla pods in bulk - i got 30+ for €11 including shipping. speaking of which, it's time to order them again, in preparation for winter baking. We still have raspberries as well. C and I made two batches of raspberry jam last week! Quite bizarre for late October. We aren't vodka drinkers, but I admire your creativity in this area. The cordials look delish.